Ethiopian Airlines (ET) has officially submitted a bid to partner Nigeria in setting up its national carrier. Its Chief Executive Officer, Tewolde Gebremariam, said yesterday that it was in the forefront to manage the proposed Nigeria Air billed to commence operations on December 24 this year. The Federal Government in London last month unveiled the name and logo of the new national carrier, indicating that it was seeking a strategic partner to invest up to $300 million on the airline. 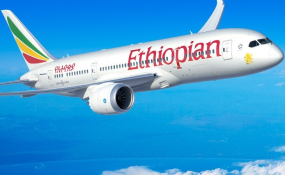 Gebremariam, at a conference in Addis Ababa, Ethiopia, said: "We are among a small group with an interest in establishing a national carrier (in Nigeria)... we do not know the results (of the tender), though we are frontrunners."